Jeremy Kalgreen is a one-man POD empire, operating the well-known Amorphia Apparel, as well as the themed spin-offs Science!, Sir Critter, Hirsute History and Teach the Controversy. Your store, Amorphia Apparel, was one of the earlier POD storefronts and one of the few to still be popular and operating today. How has the industry changed over the last 6 years? Have you adjusted your approach? For me a large part of my business comes from word of mouth and social networking, so the biggest changes have been trying to reach out where the people are active, which of course on the internet changes all the time. Myspace may have been a great place to find fans when I began, but now it is essentially a dead zone, and as such I always have to keep moving on to the next big venue: Twitter, Facebook etc, while trying to avoid being too obnoxious in how I use these forums to reach out. While most POD stores use Direct to Garment printing, yours stands out in exclusively using Flex and Flock printing techniques. How would you describe the difference in quality? If DTG techniques improved to a similar level, would you consider using that method as well? Boy I love the flex printing, It has rich full colors that never seem to fade and it lasts seemingly forever compared to the DTG stuff I’ve tried. Back when I air dried my tees, I had shirts that made it through 4 years and 200+ washes and the prints looked good as new. The DTG sames I’ve looked at always seemed a bit thin, with a lot of the shirt color bleeding through if the fabric was dark, and it never seemed to have the longevity of flex. Of course if these issues were resolved I’d be happy to make the switch. Flex comes with a number of restrictions on the designer’s end. I’m limited to a three color maximum palette, no gradients and a minimum level of detail that can prove quite a nuisance at times. If I could get the same print quality without those restrictions, I’d jump on the option without hesitation. Have you ever considered moving from POD to screenprinting? I’ve considered it, but not seriously. I feel the disadvantaged far outweigh the advantages for my business approach. My extremely low overhead means I have absolute freedom to experiment with designs. Having zero upfront investment means I can try out any silly idea that pops into my head. Essentially just throwing stuff to the wall and seeing what sticks. I can make a design with zero concern for whether anyone else will actually like it, since I didn’t have to sink any money into setup for the new design. It is a profoundly satisfying way to work, and in the end it has proven a profitable strategy. It turns out a lot of the time those random crazy ideas I think are sure losers (but personally satisfying) end up being big winners. Also going POD means I only have to do the fun stuff: designing shirts, building websites and responding to fans. I would hate to have to spend time or energy with billing / shipping or managing employees to do the same. No thanks! Your method of having several linked stores is pretty unique- would you recommend this tactic to others? What are some of the benefits? Yeah, I would certainly recommend it to others. It just started off as an experiment, but it really seems to work. It began with my Science! lineup, I did the first Science! design for my shop Amorphia Apparel which was the guitar playing robot. I really liked the design and wanted to do more, but I didn’t want to bog down Amorphia Apparel with a half dozen designs all on one theme and then a mixed bag of other random stuff. Also since the science designs are three colors they ran a bit more expensive, so I kinda wanted to quarantine them just in case the higher price point was a bit of a turnoff. So I started a second site and tabbed it to my first, in the end I found this approach had a number of advantages. Primarily this approach makes things easier to market. Having a single idea tied to its own website produces more interest at launch then if I just add a batch of designs to an existing website. Being able to develop an independent feel and theme for each site really helps the consumer connect to and remember a specific lineup. People who like the underlying theme seem more likely to twitter / blog / FB about a single serving website then just a mixed bag. It is easier to reach out to people who would be interested in one particular theme without much interest in the others. Based on my logs once people stop by any one website they tend to bounce around to check out the others, just getting them in the door, so to speak, is the important part, so providing multiple doors seems to significantly increase the traffic to all the sites in a way simply adding more designs to one site does not. I think we are seeing this approach more often on the internet in other fields. Take the ICANHASCHEEZBURGER network for example. Once upon a time people were making single monolithic ‘funny picture’ websites, just a big website with a lot of random humorous content. Now the trend seem to be make a number of parallel websites each with a razor sharp focus for their content: this website is all funny LOLcat pictures, this website is all funny FAIL pictures and so forth and then just make it easy for a user to drift from one to another. I just sort of stumbled onto the approach, but I think it’s a game changer. On the internet you don’t need to be Walmart, a big one stop shop. Instead you can be ten separate boutiques each attracting a specific target audience and have it work just as well, if not better. Of all the shirts you’ve designed, which is your favorite? Which has been the most popular with customers? Boy, that is the hardest questions isn’t it. Well my favorite seem to change day by day, but I suppose I’ll have to go with KISSinger, with the caveat that the expression on Sir Groundhog‘s face still makes me laugh. My best seller overall has been the Science Robot design, but my Devil Bones design has sold only a few hundred less but is about two years younger so it would probably be my most popular currently. 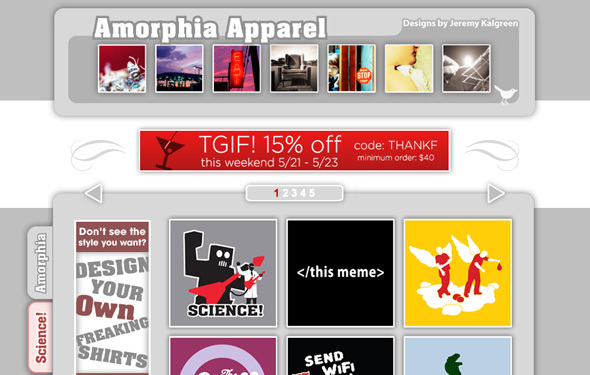 Amorphia Apparel has a great affiliate program, allowing people to earn money by linking to your designs. Was it hard to set up? Do you find affiliate marketing to be more or less effective than traditional advertising? Definitely less effective, in fact I recently discontinued my affiliate program in favor of more blog advertising. So it goes. What’s next for Amorphia Apparel? What would you hope to see happening for your company in the future? I hope the Amorphia Family of t-shirts becomes the kudzu of the internet, expanding uncontrollably and consuming all before it until eventually the world’s governments are forced to unite against me. 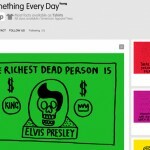 This entry was posted on Friday, May 21st, 2010 at 7:27 pm	and is filed under Spreadshirt. You can follow any responses to this entry through the RSS 2.0 feed. Keep up the great work, Jeremy! Welcome to Point Click Apparel! I created this site as a resource for artists and entrepreneurs interested in the world of on-demand apparel. Feel free to contact me with your feedback!